J. Albert (Jacques), Mihailov, S.J., Bilodeau, F., Hill, K.O., Johnson, D.C. and Holmes, A.S. 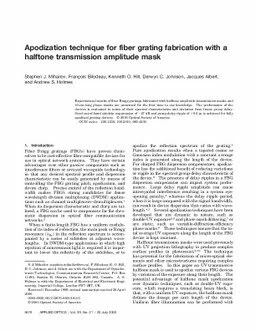 Experimental results of fiber Bragg gratings fabricated with halftone amplitude transmission masks and 10-cm-long phase masks are presented for the first time to our knowledge. The performance of the devices is evaluated in terms of their spectral characteristics and deviation from linear group delay. Good out-of-band sidelobe suppression of -27 dB and group-delay ripple of ?9.5 ps is achieved for fully apodized grating devices.